I've got loads of things and Japanese Culture to share. so I start with our New Year's Eve. We celebrated and welcome the New Year in Japanese way which is usually much more like a not-so-quiet evening with loveones. During the day, we dine out to eat Soba with my inlaws. SOba is taditionally eaten for New Year's Celebration. It supposed to be eaten on New Year's Eve. The long noodle symbolize long life. 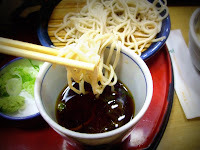 Most families prepare their home made SOba and serve it with their loveones. My inlaws just didn't have the time do it so we went to a Japanese Restaurant instead and headed to their home after and stayed for awhile. During the night, Hubby and I celebrated with beers and foods while waiting for the countdown. Lil Anzu has started to love Chicken since christmas. She even learned to toast by saying "KAMPAI!!!" clearly. She's really funny when she does that, especially with everybody. My lil Anzu continues to change every day and make us laugh with every new thing she learns. ANyway, half an hour after our New Year's Kiss (azumi was already sleeping), we had the chance to celebrate Philippines' New Year by video telephone. WOW! SOme of my cousins and relatives were there having a good time while watching my Dad jumpsparking the "paputok" (fireworks). Thanks to technology coz we felt close somehow. I missed another event in our family again. Our house is always the merriest in our street because of the party and fireworks. Hoping to spend our New Year next year with them. Yes, you had a different but wonderful New Year celebration in Japan. 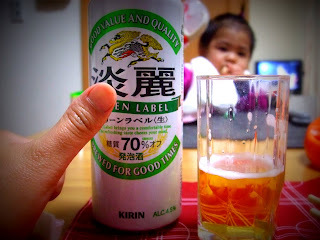 Lil Anzu is indeed very cute if she can already say Kampai, lol. Seeing the New Year celebration via web cam (I suppose) was like being here in the Philippines, hearing all the noise and merriment of New Year's eve. I believe that the Philippines has the noisiest and happiest Christmas and New Year celebration in the whole world, lol. Probably I am being biased there. Thanks for the post. Kiss little Anzu for me. God bless you all always. wow, this is a nice info, I didn't know much about Japanese culture and tradition, not even their food. Anyway, a blessed new year to you and your family. 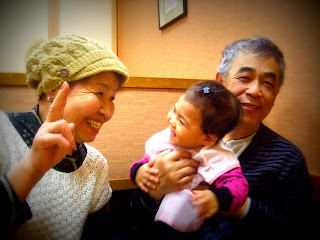 heheh..cute tingnan ni kawaii princess with her grandma nd grandpa... her smile actually makes my day--heheh! have a lovely day my friend! Agree.. this is truly the busiest time of the year! thanks for sharing this to us..ibang beer ah..ano kayang lasa niyan..hehe..
thanks for sharing a lil bit of how japanese celebrates New years...Mukhang masarap ang soba...Wow cute naman ni Anzu toasting "kampai" he..he..ivideo mo sis para makita namin..cute na cute talaga yan naimagine ko na..si hyzyd can clearly say "Dad" and "heart" pa..he..he..I wonder ba't di pa nya masabi 'Mom"..he..he...Happy new year! glad to be here again..sensya na ngayon lang ulit ako nakabalik sa ere...super busy kasi ang life...ehehhee...manic monday ako today...dami chores...lol! sige, a quick dalaw here...hugs and kisses! thanks for sharing us your new year's celebration there. i'll be waiting for more traditions that you want to share with us. happy new year! may your family be showered with more blessings this year. Taihen otsukare sama deshita,Bambie! !Same here and until now,wala pa rin akong time mag-update ng oshogastu ko,bakasyon pa kasi ng mga bata kaya hinay hinay lang muna ako sa harap ng pc. btw,natanggap mo bang nengajou ko? 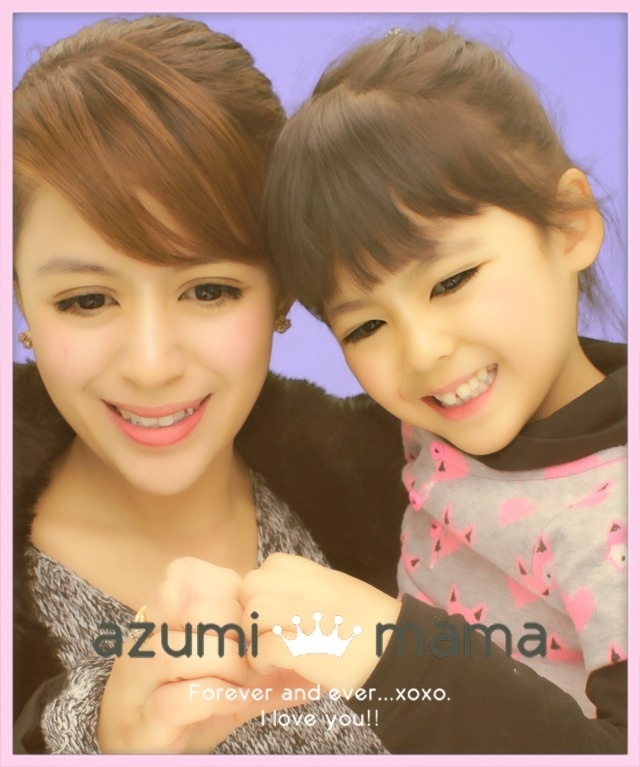 Azumi is really cute :) And I must agree that every new thing our little ones learned made us laugh. We enjoy their development. Ang saya ng New Year nyo..kakaiba! Busy New Year celebrations indeed! Happy New Year to you and your family!